Upon arriving at Madrid airport our vehicle will be waiting to transport you the 4 hour journey to our starting point in Astorga in the province of León, northern Spain. Once settled into our hotel, and perhaps after a short rest, the city of León is there to be explored before dinner. Its location at the crossroads of the Pilgrim's Road to Santiago de Compostela and the Ruta de la Plata (Silver Road) gives the city a rich legacy and one of the gems is the Casa de los Botines, a building designed by Catalan architect Antoni Gaudí. After breakfast, and once you've been 'introduced' to your bike, the cycling begins with a day of mainly flat terrain. We will probably want to get our Pilgrim passports in León before leaving, and this is in order to collect stamps along our route in order to obtain our individually named pilgrim certificate in Latin at the end of our journey. We spend the first few kilometres of the day meandering our way out of the town, across the Plaza de San Marcos and over the river. Soon we will be in the heart of the countryside as we follow the route that avoids the main road. You will experience the sense of openness that riding in the plains of Castilla offers, with the red earth, cultivated fields of cereal and quaint little and sleepy villages, with their adobe built houses and caves for keeping their treasured wine. A memorable highlight of the day, and the venue for our lunch, is the village of Hospital del Órbigo. On approaching the village we traverse the river on the very long and beautifully restored bridge that is probably the most impressive of the whole trip. After sampling the local fayre of lunch we re-saddle for the last 15 kilometres to Astorga and our hotel. Although a little more hilly, the views of the mountains of Leon up ahead will occupy our minds. Once safely installed in our hotel we can freshen up before exploring the town centre with its very impressive gothic cathedral and another creation of Antonio Gaudí, the Neogothical Episcopal Palace. The Camino de Santiago Pilgrimage has clearly left its mark on this beautiful walled town. Today´s ride is probably the most beautiful of the whole trip. We leave the Castilian plains behind us to gradually climb towards the mountains of Leon, and to the highest point of the tour, the Monte de la Cruz the Ferro (the iron cross) at 1505 meters above sea level. Early in the morning we come across the beautiful village of Castrillo de los Polvazares, where the strong orange colored stone used in the buildings creates a very special local architecture. A very steady climb up to Rabanal del Camino and several pretty villages will bring the reward of a coffee-break on a pleasant terrace. Once our legs have been rested and our bodies refueled we're on the last part of the climb to reach Monte de la Cruz de Ferro, where it is tradition to leave a small stone that you have brought from your homeland. From here the remainder of the way is mostly downhill and the views are astonishingly beautiful. If you can bring yourself to stop on the exhilarating descent we'll stop in the fantastic little mountain village of Acebo to sample the local cuisine for lunch. Acebo is a small traditional village, but full of charm in the middle of the mountains where the main street, the Camino de Santiago itself, is a line of beautiful balconied houses. After Acebo we only have to roll down the hill for another 10 kms to reach the town of Molinaseca where we'll be resting our heads for the night in a beautifully positioned hotel, next to the river and its Romanesque bridge. This valley has many fruit trees, especially cherries, and in late spring the locals are selling their tasty produce on the streets. Also a must are the roast red peppers that are a specialty of the region. Today's ride starts with an easy 25 kilometres before we begin our climb to the beautiful town of Villafranca and then onto Monte O´Cebreiro at 1300 meters above sea level. This is where the Galicia region starts and on a clear day we have the opportunity to take in the magnificent views of the Galician green valleys and the wooded mountains of Leon. We traverse the very fertile valleys full of vineyards and a wide variety of agricultural land used to produce the excellent quality vegetables and fruit of the region. Upon reaching Villafranca we'll take our coffee-break and there will be the opportunity to take a good look at the town with its many monuments and picturesque town square. From Villafranca we have an easy, mainly flat, cycle to the bottom of the valley and the foothills of the Monte de O´Cebreiro. We will have a rest in the valley before our final push of the day. There is a short but steep climb at this point, but it's very beautiful and well worth doing if you have enough energy left in you. For those that prefer the more relaxed option the support vehicle will be on hand to take them to the top of the mountain. When we reach the small village of O´Cebreiro you will feel on top of the world as you take in the great surrounding views at this high point. The village is small but full of character and its slate roofed black houses are very charming. Our hotel for the night has a very special local cheese that is served for breakfast with honey and quince jelly. Waking up in Galicia it will be evident that there is a big change in the landscape, culture, gastronomy and language. We will start to see many small villages spread around the countryside where subsistence agriculture is the way of life. A typical family will have a small plot of land which they cultivate for their own vegetables. Perhaps we will see locals working their land and taking care of their very few animals. The gastronomy in Galicia is well known for using products of very high quality and preparing them in simple, not very elaborate but delicious ways. After an initial climb we have an easy cycle due to the need to descend. A fantastic part of the day comes when we descend to the town of Samos where we find one of the oldest and most beautiful monasteries in Spain, the Benedictine monastery of Samos. The route to Samos runs next to the river Oribio so we won't be challenged to find a lovely spot to stop. 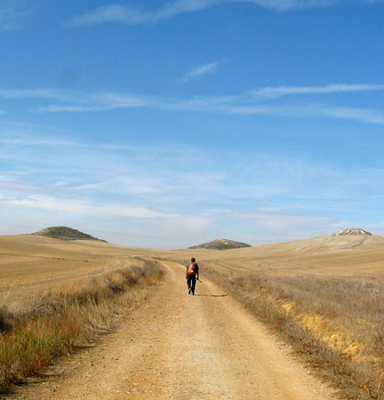 After the town of Sarria we have the option of leaving the tarmac to continue along the same trail that walkers take. Should we take this trail we'll follow the river and the paths through beautiful rural countryside to our resting place at Portomarín, an old town that was rebuilt on a hill in the 1950's to make way for the construction of the reservoir. Today´s route begins with a very nice cycle through rural Galician countryside, passing through many local villages. We spend most of the day on tree-lined roads and pathways and there is a mix of secondary roads and old paths. Our hotel is 4 kms from the nearest town of Arzua and is an old palace house that has been beautifully restored. Once settled into our rooms we'll have time to enjoy its gardens and surroundings before our well-earned evening meal. Our last ride of the week is a bit up and down, but by now we'll all have the determination and will to complete our own personal 'pilgrimage'. We will ride with the aim of reaching Monte de Gozo, only 5 kms away from Santiago, to get our first view of the distant city, and to enjoy the sense of achievement. Entering the historic city of Santiago de Compostela after such great effort and experience is a wonderful feeling, and we will ride directly to the impressive Cathedral where all pilgrims gather. We will be able to get our pilgrim certificate and enjoy the good food and the lively atmosphere of the city. Unfortunately everything has to come to an end. After enjoying a restful night's sleep, and replenished by a hearty breakfast, we have an opportunity to enjoy, until next time, the magnificent morning views, and pack and prepare for departure. We'll say our goodbyes and leave you to make your way to the airport or train station, hopefully with fond memories of the week.